Microsoft started this battle against Chrome last year – so it wouldn’t make sense for them to not fire back when Google claimed about battery life improvements in the new chrome. Microsoft already had made tall claims about the battery life performance with Edge last year and went as far as advertising against Chrome within Windows 10. However, with the Anniversary Update for Windows 10, Microsoft worked on improving plenty of things – one of them being battery life improvements with Edge. Google wasn’t sitting idle either – just a week ago, Google released a video showcasing the battery life improvements they had made going from Chrome version 46 to 53. As we pointed out, something didn’t quite make sense: the numbers were wildly off when compared with the test Microsoft ran – despite being a similar test. Today, Microsoft has fired back with a brand new test doing the same thing once again. In the new test, Microsoft is using Chrome v53 – the same one that gave Google a whopping 10 hours 39 minutes in their test. 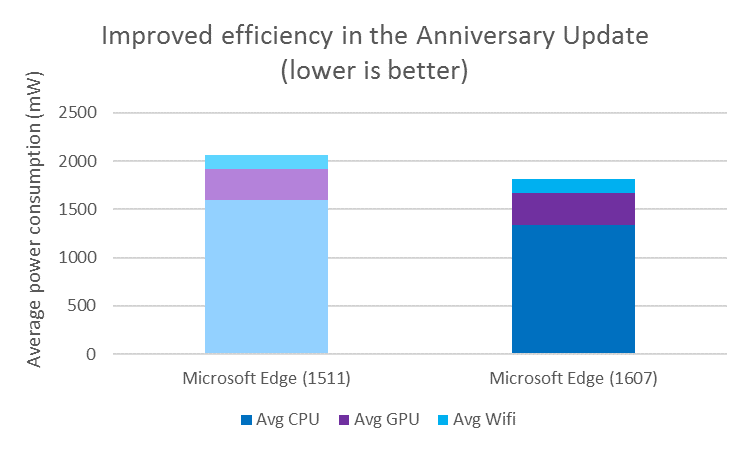 Microsoft seems to have gotten a better result for Chrome than even Google did – however, Edge still has an edge (eh?) over it by a bit more than an hour. It is great to have companies competing over something like this – physical batteries aren’t getting better anytime soon, so optimizing the software to run longer on the current technology is the only option we have got. Hopefully, Google will keep improving their battery performance and compete once again with another video proving Microsoft wrong. This is the sort of healthy competition that is required between these industries. It is, however, clear that if you want longer battery life out of your devices, you should be using Microsoft Edge rather than Chrome – or Firefox for that matter, which is even worse somehow.